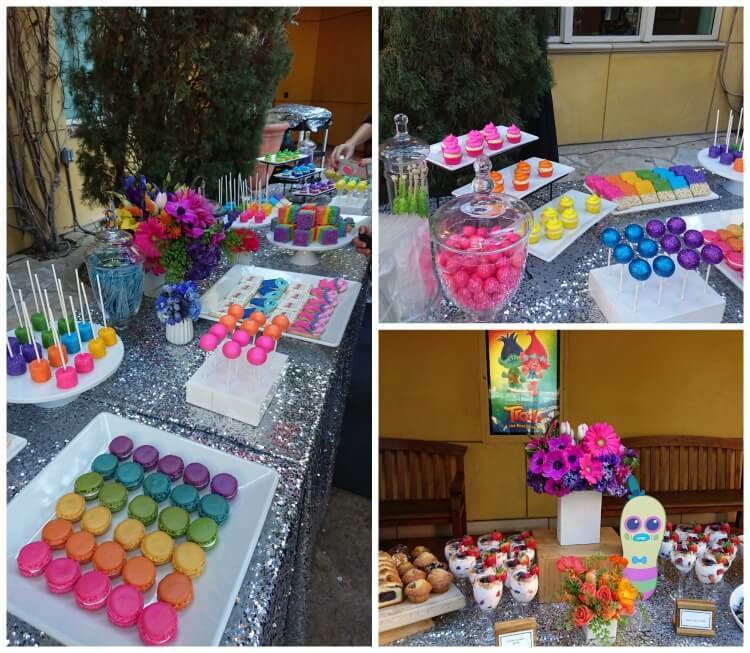 You are here: Home / Lifestyle / Trolls Birthday Party Ideas- Rainbow Sparkly Fun! Trolls has already become a popular birthday party theme for kids since the Trolls movie but I think it is going to become an even more popular choice. Today marks the release of Trolls: The Beat Goes On, an original Netflix series and it is going to be huge. Poppy and Branch are just such fun, cute characters that both boys and girls can relate to. Plus, there is the whole rainbow and sparkles element and who could resist that? 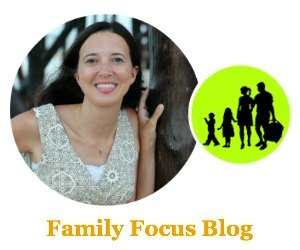 So today, I am going to share with you several fabulous Trolls birthday party ideas that your kids will just flip for. The Trolls birthday party ideas I’m about to share with you are absolutely some of the best Trolls party ideas out there. How do I know? 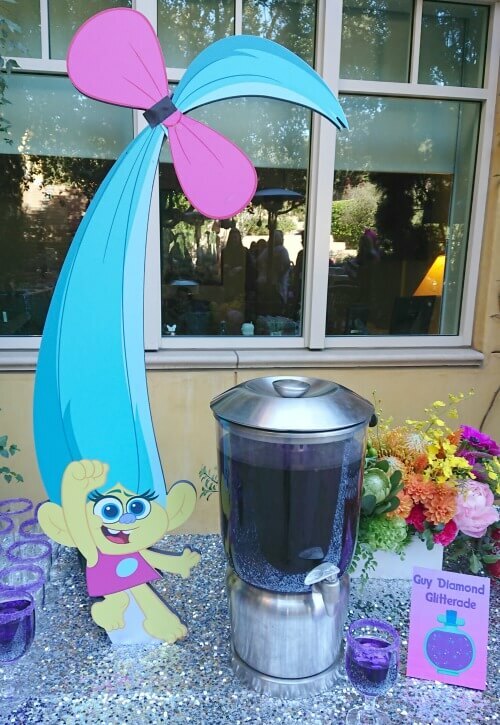 Well, because I got most of them from a DreamWorks Trolls Party that I attended (during a behind-the-scenes DreamWorks event) and let me tell you, they sure know how to throw a party! First up are your Trolls party invitations. You can get some super cute ones made just for you on Etsy. I have also seen them for sale at Party City and Oriental Trading. I even found adorable free printable Trolls party invitations on Pinterest and Musings of An Average Mom has all the Trolls printables you could desire! 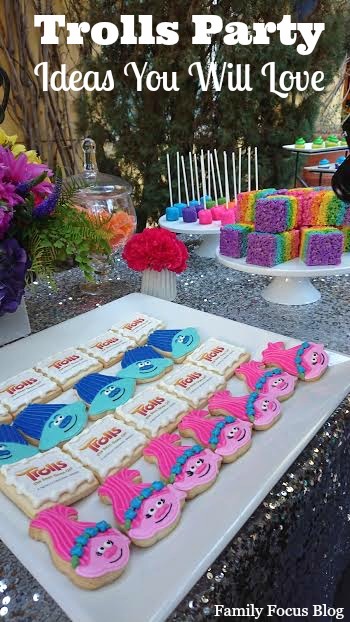 Trolls party decorations are the so colorful and cheerful- a rainbow of colors and sparkles! 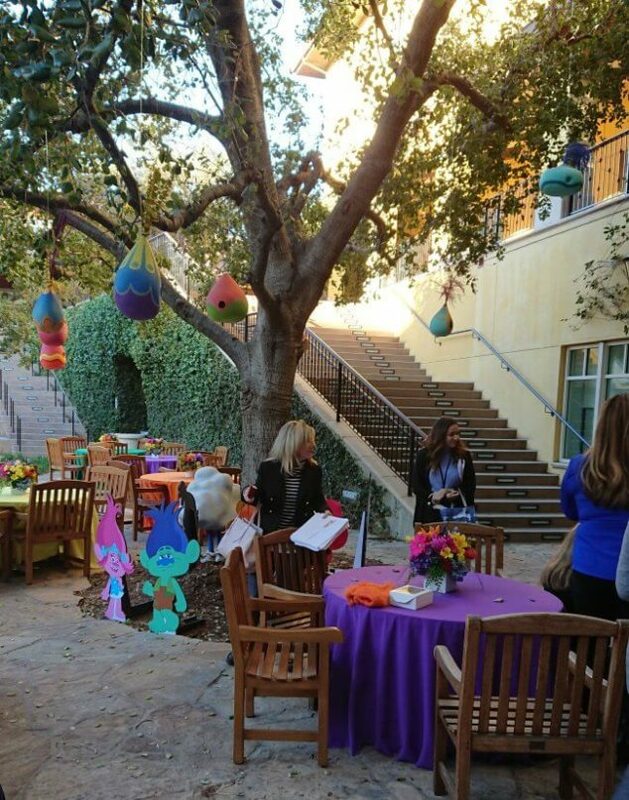 You can make Trolls tree houses with old gourds and some colorful paint (or balloons and markers) and hang them from the trees for an outdoor Trolls birthday party. Or make miniature Trolls tree houses to hang from house plants. 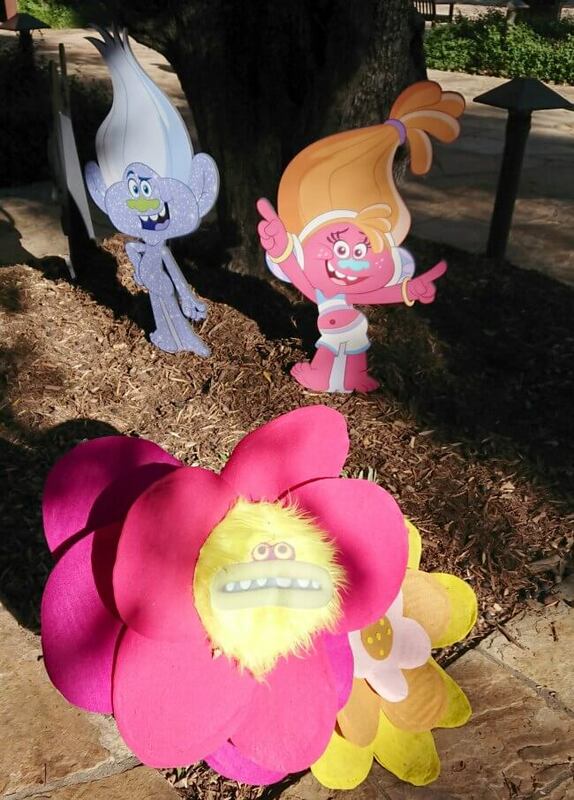 You can buy or make cardboard cut outs of your favorite Trolls characters and place them around for fun Trolls party decor. 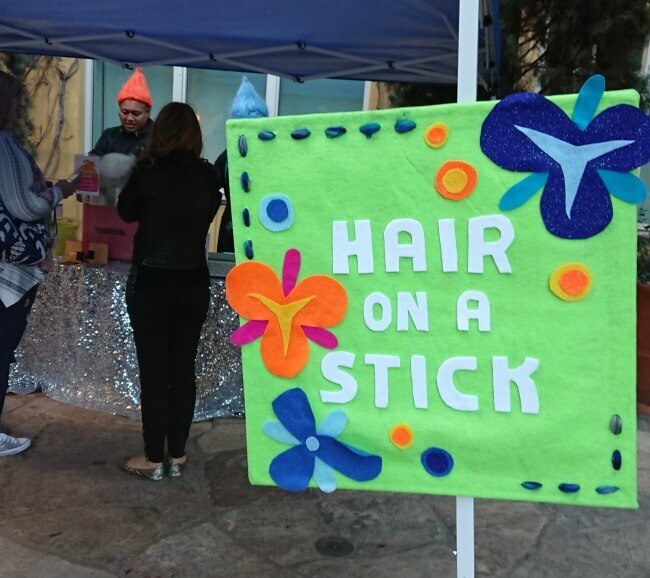 You can also make fun, functional Trolls themed party signs, like “Troll-ific Hair” for a make your own troll hair craft station or for a cotton candy bar. You can use cardboard and paint or felt and glue for an extra fancy feel! You can buy or make your own Trolls party banners. That is one of the things I love about the Trolls party theme- just go colorful and sparkly and you are on theme. You can find a cute DIY Trolls Banner tutorial here if you prefer direction. Go with various colors of bright fun colors for tablecloths or you could even go silver sparkles! For plates you can buy Troll themed tableware or just go with bright solid colors. 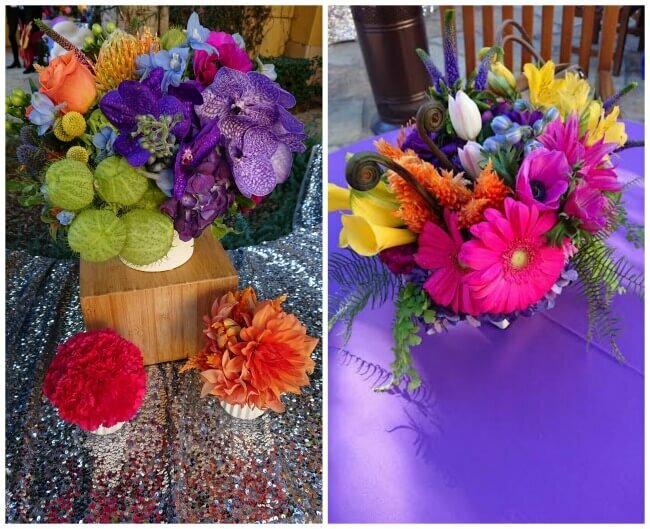 Colorful rainbows of flowers are the perfect accent to your Trolls party and of all the Trolls birthday party ideas, it is the easiest way to dress up your party and give it an adult appeal. The more exotic the more it will look like it is from the land of Trolls. There are literally endless Trolls birthday party ideas when it comes to decorations! You can do an assortment of rainbow foods for your Trolls party food plus some specialty items. Some suggestions: rainbow cupcakes, rainbow macaroons, rainbow cake pops, rainbow rice crispy treats, rainbow marshmallow sticks, rainbow candies, and rainbow fruit trays. The Trolls specialty items I referred to would be a Trolls cake, Trolls cookies, and/or Trolls cupcakes. You can even have a DIY trolls cupcakes station if the kids are old enough or if the parents help younger children. Punch in fun colors is the perfect trolls party beverage. Lemonade and sprite in fun colors works well too. You could use food coloring to give the fun colors but I would suggest sticking to natural coloring like a bit of grape juice, beet juice, or carrot juice added to the lemonade. You can create “Guy Diamond Glitterade” with some fun colored sugar around the glasses rims if you want to go fancy. Fun trolls party craft stations are a great way to complete the birthday party fun. 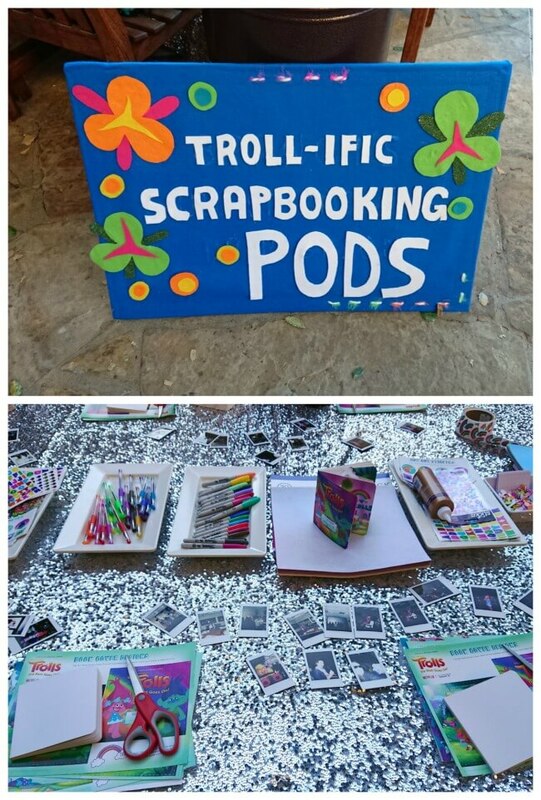 You can have a station to make Troll hair headbands and/ or you can have a scrapbook station. This is perfect because Poppy loves scrapbooking and kids these days just don’t get enough of that activity. You can buy little blank scrapbooks or make your own with several sheets of blank paper. Then you can provide fun Trolls themed stickers and have polaroid cameras so that guests can capture themselves at your Trolls party. You can even have a Trolls photo backdrop area. 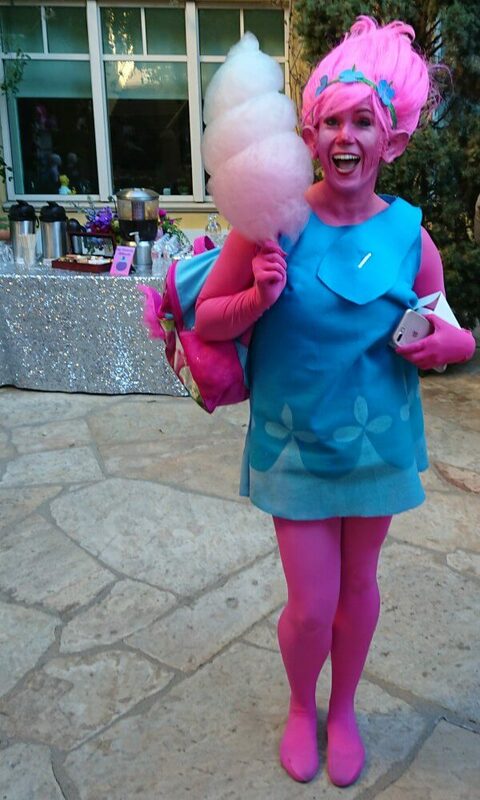 I had fun in the photo booth with The Typical Mom at the DreamWorks troll party! These DIY headbands and scrapbooks can even serve as your Trolls party favors. If the above mentioned DIY Trolls Party Favors aren’t your thing, there are a gazillion Trolls play sets and dolls and Trolls themed blankets and such that you can give your guests. You can always make these adorable DIY Trolls party favor bags from Clementine County too! Or you could even just do to go boxes for all those yummy Trolls snacks. For more information about the new DreamWorks Trolls TV show on Netflix you can visit http://www.dreamworks.com/trolls/. 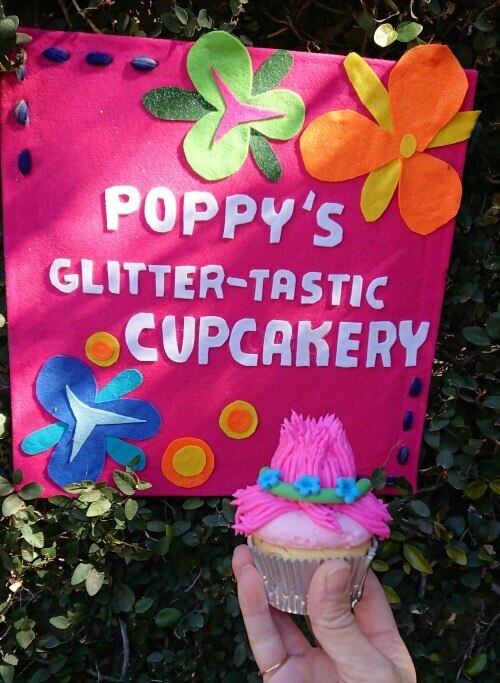 If you want more ideas, you can visit Freebie Finding mom’s rainbow party ideas! 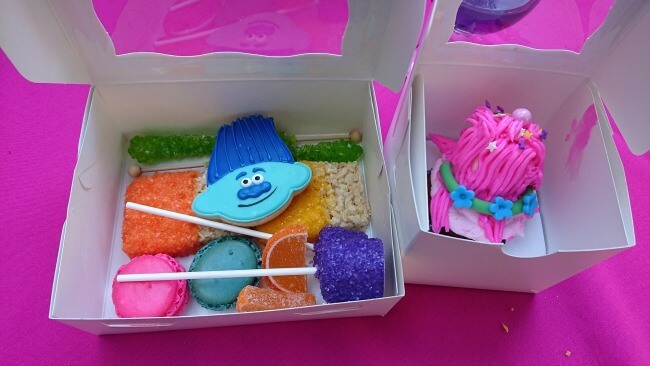 Which one of these Trolls birthday party ideas is your favorite? I should mention that if you want to go all out- you could even have life size Trolls (see christina.is.crafty above and her homemade Trolls costume of Poppy for inspiration) at your party dancing away to fun dance music and posing for photos. That is a little above and beyond expectations but it would make your Trolls birthday party the best party ever!